The words conjure up images of workshops where young people are set to work and taught a livelihood. What many don’t realize is that the concept of vocational training which included love for and caring of the young, abandoned by society, was initiated by a living, breathing person who himself had suffered much during his childhood. It was none other than John Don Bosco, who having lost his father at the tender age of three and struggled with his mother and family to survive in Becchi, northern Italy, who set in motion this concept not only in Italy but across the world. The story goes that when he was nine, he had a dream that was prophetic – being among a crowd of children at play, some of whom were cursing, John was hitting and kicking them to make them quiet. Suddenly, a man appears and advises: “Don’t hit them, with kindness and love you must win over these your friends. I shall give you a Teacher under whose guidance you will be able to become wise, and without whom, all wisdom becomes nonsense”. The man was Jesus and the teacher would be the Virgin Mary. Later John learnt to be an acrobat, magician, singer and juggler to attract friends and keep them from sin. Wanting to dedicate his life to young people, he worked by day and studied by night, entering the Seminary of Chieri at 20 and being ordained as a priest in Turin in 1841, at 26. Seeing the teeming masses of orphaned or abandoned young people looking for work to keep body and soul together, Don Bosco gathered them together on Sundays, sometimes in a church, out on a grassy meadow or in the town square to get them to play and instruct them in Catechism. Overcoming many a challenge which included strong opposition from the enemies of the Church, civil authorities and even some Ecclesiastical authorities, he opened his first oratory five years later at Valdocco to provide the simple things in life to “his rascals” – food and a bed. They would also learn a trade. On them, he spent what little money he had, his time, his talent and his health. Later he extended his work to different parts of Italy, other countries of Europe and to South America. Those were the humble beginnings of the Salesian Congregation comprising priests and lay people who wished to continue his work. Unwilling to leave out young girls, Don Bosco founded with Saint Maria Domenica Mazzarello, the FMA, the Congregation of the Daughters of Mary Help of Christians. The Salesians and the Daughters of Mary Help of Christians have spread throughout the world in the service of young people, the poor and suffering, with schools of every type and level, technical and professional institutes, hospitals, dispensaries, oratories and parishes. Don Bosco’s work was the result of his strong bond with God and even though he went to meet his Maker on January 31, 1888, in his austere room at Valdocco when he was 72 years old, that first 18-member Salesian Society has grown in leaps and bounds to more than 16,000 Salesian Priests and Brothers, more than 14,000 Salesian Sisters and more than 24,000 Salesian Co-operators worldwide. Pope Pius XI who was known to Don Bosco personally, proclaimed him a Saint on Easter Sunday, April 1, 1934. Having visited villages and towns across the globe, the relic of St. John Bosco will arrive in Sri Lanka on Saturday, November 19, for a 12-day visit where people can venerate him from Dungalpitiya in Negombo to Ahungalle in Galle, from Dankotuwa to Nochchiyagama and from Mannar to Kandy. This pilgrim journey through 130 nations in five continents began on January 31, 2009, to mark the 150th anniversary of the founding of the Salesian Congregation and in preparation for the celebration of the 200th birth anniversary of Don Bosco on August 16, 2015. The relic of Don Bosco, the right hand, recomposed from the urn that contained his remains since 1929 when the body was exhumed for his beatification and eventual canonization, has been enshrined within a wax replica of his body, which in turn is enclosed in a large glass casket. The casket is mounted atop a large wood and metal cart. Among its decorations are the words, "Da mihi animas, ceatera tolle" ("Give me souls, take away the rest") one of Don Bosco's many quotes. Images of young faces also surround the urn, as well as maps showing where the Salesian Family is present today. The urn weighs 820 kilograms (over 1,800 pounds!). 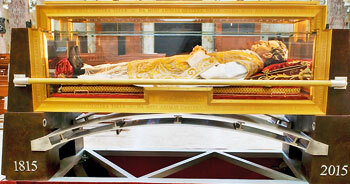 The glass box, containing the relic, is 253 cm long, 108.3 cm wide and 132 cm tall. The full urn is transported via two specially-designed and built trucks. Accompanied by a team of specially-trained Italian security police, the relic casket will be taken in procession to the public at the various Don Bosco institutions and important shrines and parishes across the island. November 28-30 – Negombo and departure from there. The very first Don Bosco Centre in Sri Lanka was established in 1956 at Negombo and currently the Salesians have established 17 centres across the island stretching from Hambantota to Kilinochchi. These centres provide vocational education for underprivileged youth, moulding them into skilled, constructive and law-abiding citizens who contribute to the country’s growth, said Rev. Fr. Nihal Liyanage sdb who heads Don Bosco Sri Lanka as Provincial Superior. Maldivian luxury, personal attention at a price of course! Ideal home remedy for the travel bug! Look who’s minding our business now!